We've got skewers on the grill today! I think skewers are great for parties. 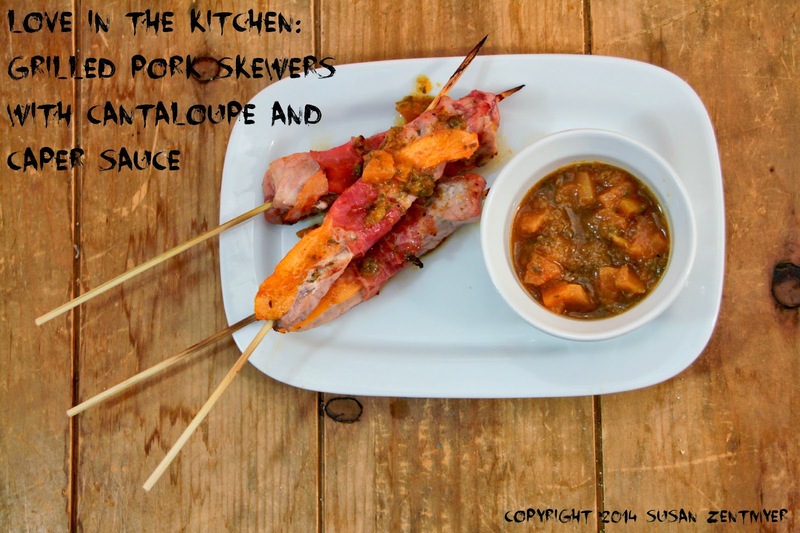 They are easy to portion, and you can create a variety of different kinds of skewers so everyone is happy. You may be wondering about the choice of ingredients for these skewers. Well, Love from the Grill is cooking for June's Crazy Ingredient Challenge. And this month's ingredients are cantaloupe and capers. But here's the thing - cantaloupe and capers might not be that crazy after all. I mean, cantaloupe is mild and sweet, while capers are tangy and salty. We've all had sweet and salty combinations before. And this sweet and salty sauce goes wonderfully with pork. 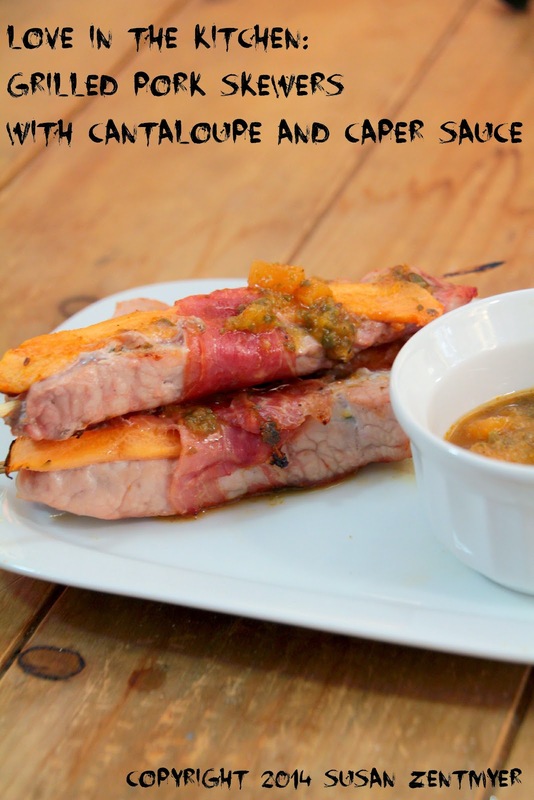 Add a slice of cantaloupe for and extra touch of brightness and some prosciutto for a little bit of smoky flavor and a touch of crispness and you'll think these "crazy ingredients" are genius! Here's a tip for serving skewers - before plating, the the skewer down with a fork or tongs and turn the skewer to loosen the meat from the skewer. It will make it easier for your guests to enjoy it! Check out the recipe below - you can see just how easy these are to make. And go see what other delicious creations the Crazy Ingredient Challenge Chefs have made! Soak 18 wooden skewers in water. Cut the pork chops, lengthwise, into 3 pieces each (each piece should be approximately 1 inch wide and 4 inches long). Thread a skewer through each piece of pork lengthwise. Slice 18 long thin thin slices of cantaloupe, then dice the remaining cantaloupe into 1/4 inch pieces. Slice the prosciutto into 18 long thin pieces. 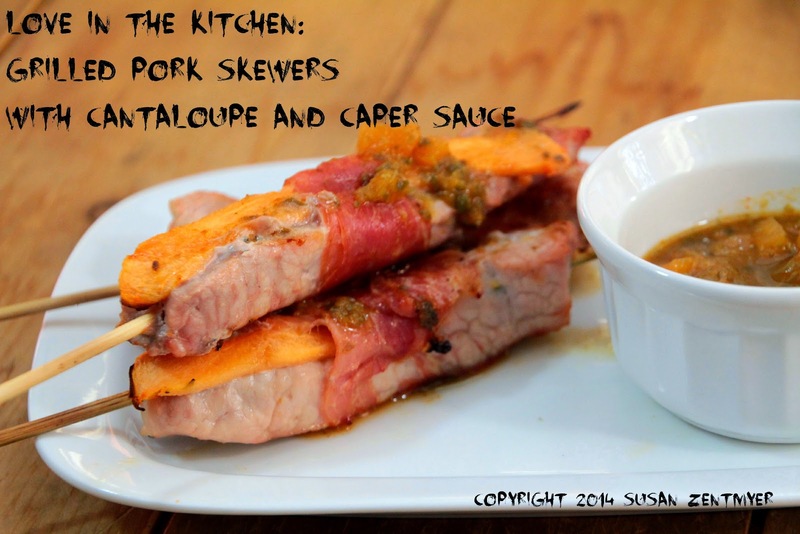 Place one slice of cantaloupe lengthwise on top of one pork skewer. Wrap one piece of prosciutto around the middle of the skewer, securing the cantaloupe onto the skewer. (See photo above for guidance.) Repeat with remaining skewers. Preheat the grill to high and oil the grate. Meanwhile make the sauce. In a small saucepan, bring the cantaloupe, capers, chicken broth and red wine vinegar to a simmer. Simmer until sauce is reduced by 1/3. Remove from the heat. Puree 2/3 of the sauce in a food processor or blender, and then add the puree back to the saucepan. Stir together and add pepper to taste. Add the skewers to the grill, and cook for about 3 minutes, or until the pork is lightly browned on the bottom. Carefully turn the skewers and grill for an additional 3 minutes. Remove from the grill. Serve with 2 - 3 tablespoons of the reserved sauce. Well I have to say that this is the most interesting link of our CIC link this month. I would never have thought of this. Thanks Dawn - it was fun being part of this challenge! I'm going to reiterate what Dawn said. Definitely the most creative. Looks great! The sauce sounds really good!